A marquee is the foundation of your party or event. 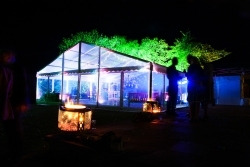 Based in Oxford, our team will guide you through the choices of marquees available. We can supply traditional pole marquees and tents, freestanding modular clearspan structures, also know as frmaed marquees, Bedouin tents, capri marquees, trispan or saddlespan tents, Chinese hats or witches hat tents, stretch marquees and even inflatable tents, inflatable stage coverings, domes and pods. Marquee flooring, uplighting and linings to include black and white star-lit ceilings and dancefloors can also be provided. Below is a selection of some of the marquees we offer. Please get in touch for more examples. We can meet with you for a no obligation site visit where we will measure up for your marquee.